The moving average measure, which smooths out the volatility, was 0.54, well above average (“zero” indicates average growth over the 1990-present period). The service and construction sectors made negative contributions. The household sector made a large positive contribution, again supported by broad labor market indicators of unemployment and initial claims as well as consumer confidence. 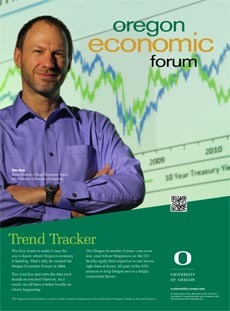 The University of Oregon Index of Economic Indicators rose in December, gaining 0.2 percent over the November reading. Employment services payrolls (mostly temporary help jobs) declined but this indicator has been volatile this year while the general uptrend has remained positive. Initial unemployment claims remain at historically low levels consistent with ongoing job growth. The decline in the UO Index in recent months is not sufficient to raise recession concerns. Together, these indicators still suggest ongoing growth in Oregon at an above average pace of activity. That said, it appears that the economy slowed as 2018 drew to a close.